Nike Mens Black & White Geometric Hooded Running Jacket XL BNWT. Condition is New with tags. Dispatched with Royal Mail 1st Class. 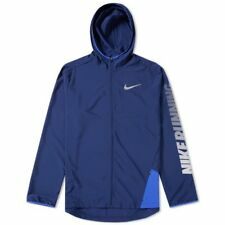 Nike City Core hoodie jacket is made of waterproof and breathable fabric. Perfect for racing in the city. Written 'Nike' on the left arm. Nike logo printed on the back. High collar integrated to the cap. Adjustable multi-panel hood enhances coverage. Machine wash. Zip chest pocket. Reflective details stand out in low light. Fabric: 100% nylon.